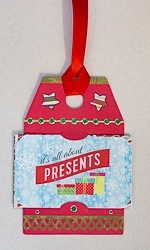 Handmade tag shaped gift card holder tag ornament. Made with die-cut card stock and paper parts that have been layered for texture. Envelope affixes to front of ornament to hold a credit card sized gift card or use to put money into instead. Use as a package tag or hang on the tree. Approx. 3 1/2" wide by 4 1/4" tall with a To/From panel on the back. Note: Only one available for each design.